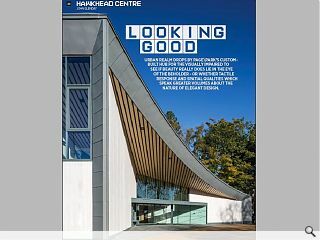 Urban Realm dropped by Page\Park’s custom-built hub for the visually impaired to see if beauty really does lie in the eye of the beholder - or whether tactile response and spatial qualities which speak greater volumes about the true nature of elegant design. Paisley’s traffic choked Hawkhead Road is the setting for Page\Park Architects latest collaboration with Scottish War Blinded, a charity dedicated to transforming the lives of ex-servicemen, who are facing their own personal battles against sight loss long after their tours of duty have come to an end by providing the facilities they need to thrive whilst maintaining their independence. 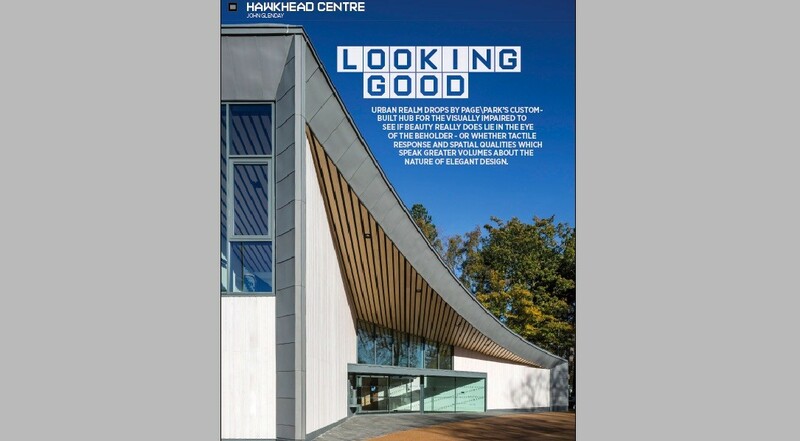 The Hawkhead Centre occupies a former garden centre on a sizeable corner plot, providing sufficient land to build a dedicated day care centre offering a range activities, workshops, training and social opportunities for members in addition to a care home, designed by Unum Partnership on behalf of Royal Blind. 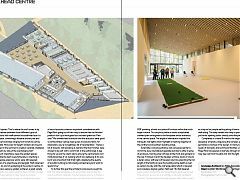 Maximising the opportunities presented by co-location in terms of shared facilities, staffing and infrastructure the dual development follows on from Page\Park’s delivery of a sister (albeit more rural) facility at Linburn, West Lothian. Perhaps appropriately all this activity is barely visible from the road, taking place as it does behind the low-slung confines of an arcing structure that is both screened by a healthy amount of foliage and sunk within a fortuitous pre-existing hollow which helps the building to nestle far lower than its bulk would ordinarily allow. Instead its full presence is only felt when turning off into the painstakingly manicured grounds. Notable by its absence was signage, which will be added at a later date to custom walnut panels above the doors. Instead, priority has been given to three dimensional tactile objects outside each room so the visually impaired can find their way by, for example, placing a wooden mallet at the entrance to the workshop so that as members feel their way along the guide rails they will know where they are. Going forward the centre will built its own signs in its workshop. To accentuate visual contrast different wall panels were used for the doors and frames to help pick them out and handrails are deliberately darker than the lighter walls, with braille stud embedded below to identify each room. 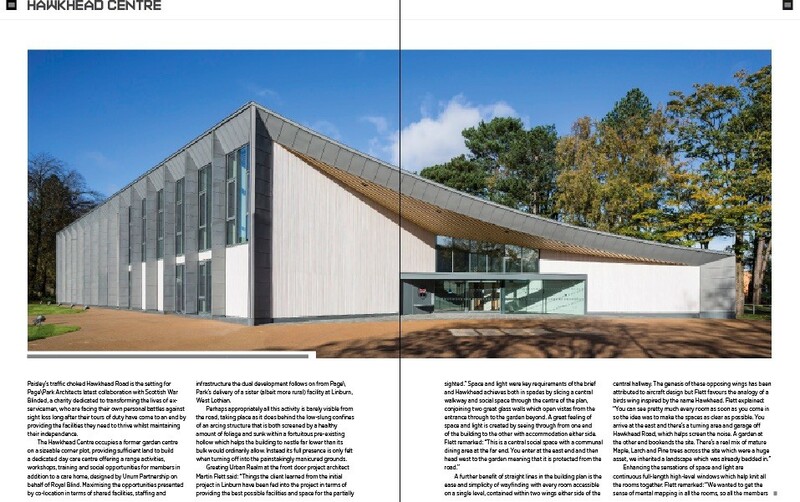 Opening out to a cavernous dining space to the west, more transparent than the eastern elevation, this volume contains a café pod which sits under the dramatic sweep of the roof. 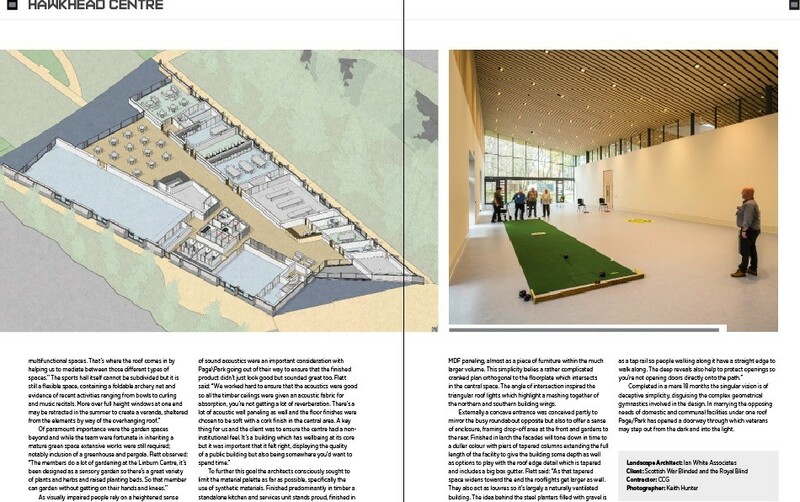 Backing onto a services core this element includes WC’s, changing rooms, a kitchen and gym with office space above. 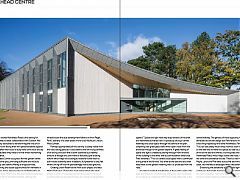 Flett said: “It contains the catering kitchen and cloak room at the far end. 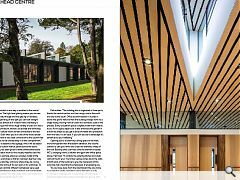 The timber ceiling comes down the walls at both ends of the building to give the impression of this wing-like roof, imparting the impression of enveloping you. To further this goal the architects consciously sought to limit the material palette as far as possible, specifically the use of synthetic materials. Finished predominantly in timber a standalone kitchen and services unit stands proud, finished in MDF paneling, almost as a piece of furniture within the much larger volume. This simplicity belies a rather complicated cranked plan orthogonal to the floorplate which intersects in the central space. The angle of intersection inspired the triangular roof lights which highlight a meshing together of the northern and southern building wings. Completed in a mere 18 months the singular vision is of deceptive simplicity, disguising the complex geometrical gymnastics involved in the design. 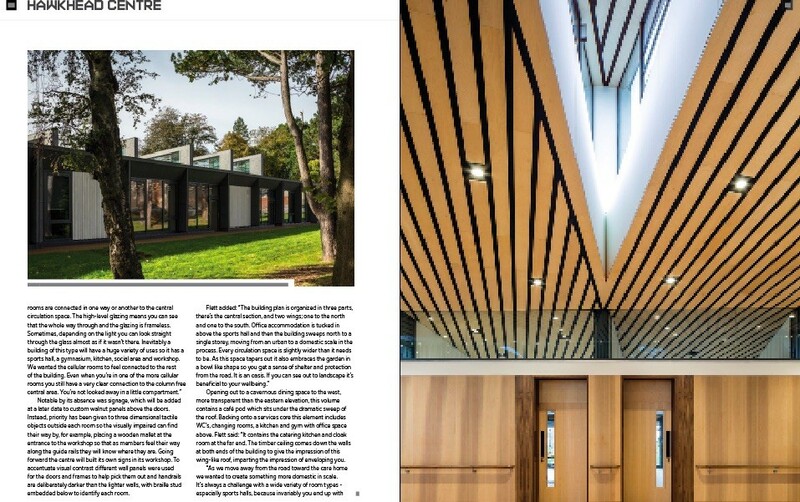 In marrying the opposing needs of domestic and communal facilities under one roof Page/Park has opened a doorway through which veterans may step out from the dark and into the light.